You’ve recently banned foreigners who support boycotts against Israel or Israeli settlements from being allowed to enter Israel – even Jewish foreigners, a first for the self-proclaimed Jewish state After all, your “Law of Return” has allowed (and encouraged) Jewish foreigners to freely immigrate to Israel, even as multitudes of Palestinians have been banned from returning to their homes. People throughout the Western world have objected in outrage to your new law, particularly Jewish Westerners who have family and connections in Israel from whom they’ll be cut off in retaliation for their political positions. Critics, even some who oppose boycotting Israel and who have had no problem with excluding Palestinians, have called out the law for diverse reasons: its quashing of free debate and political expression, its anti-democratic nature, how it will affect them and others personally. But I’m not trying to visit Israel. I want to go to Bethlehem and Nablus, Ramallah and Hebron, Jenin and Tulkarem. I hope to return to Khan Yunis, Rafah, Gaza City, and numerous other towns and villages in the West Bank and Gaza. In other words, I want to go to Palestine – a country recognized by 136 countries around the world. But your law, astoundingly, prevents me from visiting that country. You control entry and exit to the places I want to visit, even though they’re not part of your territory, or included in your exclusive democracy. When I was born, Palestine referred to the whole of the land that your founders then ethnically cleansed and renamed. Now, it officially refers to a few segments of land, surrounded and trapped. Unlike the residents of every other country on earth, Palestinians are not free to travel to and from their own country unless a foreign country gives them permission – a normally universal right that you routinely deny: to young and old, Muslims and Christians, professors and paupers, men and women. Visitors are similarly obstructed. You decide whether they can get in, and whether they can get out. When I try to visit Bethlehem, for example, I must face your armed soldiers manning the Kafkaesque, towering concrete wall you have erected on Palestinian land. These gun-toting youngsters will decree whether or not I and others – including Palestinian descendants of Bethlehem’s ancient shepherds – can pass through. In other words, Israel is essentially imprisoning over 4 million men, women, and children (with some help from Egypt, its proxy to the south). Israeli jailers, euphemistically “border guards,” determine who may even visit this incarcerated population, and what supplies may reach them. Over the years I’ve seen you prevent numerous individuals and groups, many bringing medicines and life-saving supplies, from visiting this captive population. You’ve blocked sons from visiting dying mothers, suffering children from receiving critical medical care, malnourished toddlers from receiving help. It is a profound shame upon the world that this cruel and unconscionable condition has been permitted to persist year after year. There should have been massive and irresistible objections long before your recent legislation. I remember when the United States opposed the Iron Curtain. Today, the U.S. gives the perpetrator of this current captivity $10 million per day. Israel already denied me entry once 15 years ago, locking me up for 28 hours in a detention cell in Ben Gurion Airport before expelling me. I remember Israeli officials telling me I was not “allowed into Israel.” They didn’t even supply a reason. Next time, they may say it’s because I endorse BDS, which I wholeheartedly do. But I’m not trying to go to Israel. I want to go to Palestine. 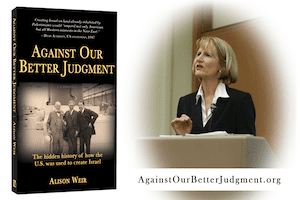 Alison Weir is executive director of If Americans Knew, president of the Council for the National Interest, and author of “Against Our Better Judgment: The Hidden History of How the U.S. Was Used to Create Israel.” This article was first published by Dissident Voice. * The top photo was taken on Friday, Sept 22, 2009. Palestinians from the West Bank were trying to to go to Jerusalem to attend the third Ramadan Friday prayers at Al Aqsa mosque, a traditional event.